FORT BLISS, Texas -- Last year, a devout Christian Soldier deployed in Kuwait knocked on the door of Army Buddhist Chaplain Capt. Christopher Mohr and entered his office in silence, closing the door abruptly behind him. The Soldier did not say a word. Mohr could see that he was emotionally frazzled and too distraught to speak. All of a sudden, the Soldier broke down and began crying hysterically. He explained to Mohr that his significant other had been sexually assaulted back home. Mohr just listened calmly and let the distraught Soldier vent. The Soldier was livid and felt guilty for not being at home to protect the one he cared about. After several sessions over the next few weeks, Mohr helped the Soldier make peace with himself. 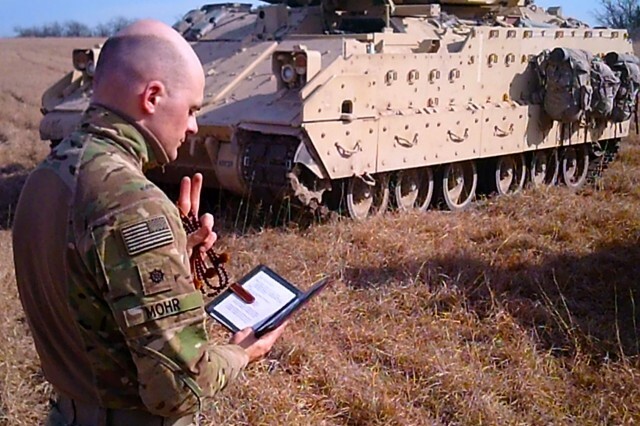 Mohr, 36, is one of three active-duty Buddhist chaplains in the Army, but more importantly, he said, he's one of about 3,000 chaplains in the total force. Mohr said that he felt called to the Army to serve and minister to Soldiers of all faiths. He said that first calling still drives him regardless of faith or denomination. In July, Mohr was transferred to Fort Bliss, Texas, where he now serves as the battalion chaplain for the 93rd Military Police Battalion. Among the challenges Mohr sees at his new post will be getting to know the military police mindset while understanding the very different mission set that the military police have, compared to the combined arms unit that he was assigned to where he served as the battalion chaplain for the 2nd Battalion, 70th Armor Regiment at Fort Riley, Kansas. "At Fort Riley, I knew of 30 Buddhist Soldiers," Mohr said. "With a somewhat higher population at Fort Bliss, I will likely have more Buddhist Soldiers to serve." Mohr said at Fort Riley, he held Buddhist services for his very small congregation weekly, or as frequently as possible when in the field. "I welcomed anyone who wished to attend my services even if it was just out of curiosity. My job is to provide religious support to anyone who asks." 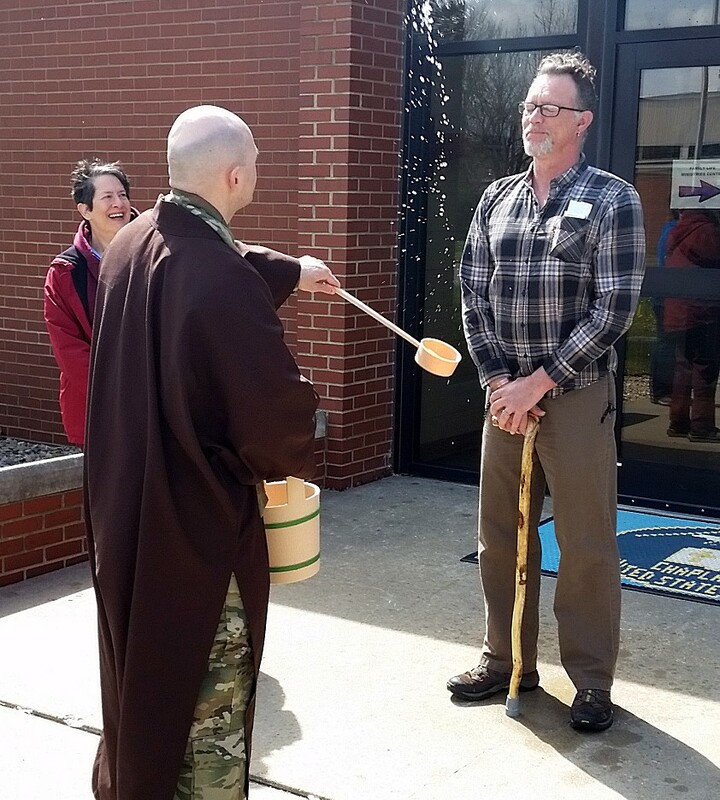 Mohr accepted a direct commission into the Army eight years ago to serve as a Buddhist chaplain because he saw a spiritual need that he felt he was capable of meeting. Mohr has conducted various command ceremonial functions upon request, such as offering invocations and benedictions at changes of command and at prayer luncheons. If he is asked to perform a task that he was unable to perform, such as conducting a Catholic Mass or a Catholic wedding, for example, he will refer such requests to a chaplain who could. Mohr said that this is a key concept in the Chaplain Corps, and one he enthusiastically supports. Other examples of Mohr serving Soldiers without regard for differences in faith included providing a Jewish Soldier with Kosher Meals-Ready-to-Eat during his unit's recent field training. Mohr coordinated with supply personnel to ensure those meals were available during training. He also said that during this past Memorial Day, he was honored when he was asked to offer the invocation and benediction at the National World War I Museum in Kansas City, Missouri. One of Mohr's greatest honors so far occurred a few years ago when the California Army National Guard asked him to conduct a military funeral for a Buddhist Soldier. The Soldier's family, who was also Buddhist, specifically requested that a Buddhist chaplain conduct the service. -- Ullambana, an observance for the departed and those who are suffering, is held in July or August. It can be challenging to find ways to conduct unique, meaningful Buddhist events like the yearly Lantern Floating, he said. The event is similar to the much larger Lantern Floating conducted each Memorial Day in Hawaii, which includes music and a ceremonial ignition of the Light of Harmony, that leads up to the floating of lanterns onto the Pacific Ocean. Mohr figures that he has served the spiritual needs of about 150 Buddhist Soldiers since he was commissioned in 2009. He has provided spiritual support and comfort to injured Soldiers as often as necessary, and this year alone, he has helped nine suicidal Soldiers work toward resolving the issues that brought them to their darkest places. Mohr said that when most non-Buddhist Soldiers meet him for the first time, they are often cautious and curious. "That usually shifts pretty quickly to a place of trust and openness as soon as they realize I'm a Soldier and here to help them if they need it." Mohr said that, typical of all chaplains, most of his days are filled with a mix of staff meetings, ministry of presence, being present where Soldiers are training or working and addressing concerns or issues that they bring up, and spiritual guidance or counseling sessions wherein a Soldier's issues are given full attention in a more formally confidential setting. "However, you never know when a request for help from a Soldier or an Army couple seeking to plan their wedding will take precedence and shift the entire plan for that day," Mohr explained. Mohr said the highlights of any day are when he gets to work with fellow chaplains to "deliver relevant, meaningful ministry experiences." These would include a spiritual fitness run conducted with Christian chaplain peers or bringing another chaplain to visit his unit to conduct worship services in the field. After Mohr graduated from Menasha Senior High School in Menasha, Wisconsin in 1999, he attended the University of Wisconsin at Oshkosh from 2001 to 2004 and earned his bachelor's degree in Religious Studies focused on Buddhism, and the Japanese language and culture. From 2002-2003, Mohr spent another year in an exchange program at Sophia University in Tokyo, Japan. In 2011, Mohr received a master's of divinity in Buddhist Chaplaincy from the University of the West in Rosemead, California. Mohr accepted a direct commission in 2009 as a chaplain candidate, and was assigned to Joint Force Headquarters in the Wisconsin Army National Guard. 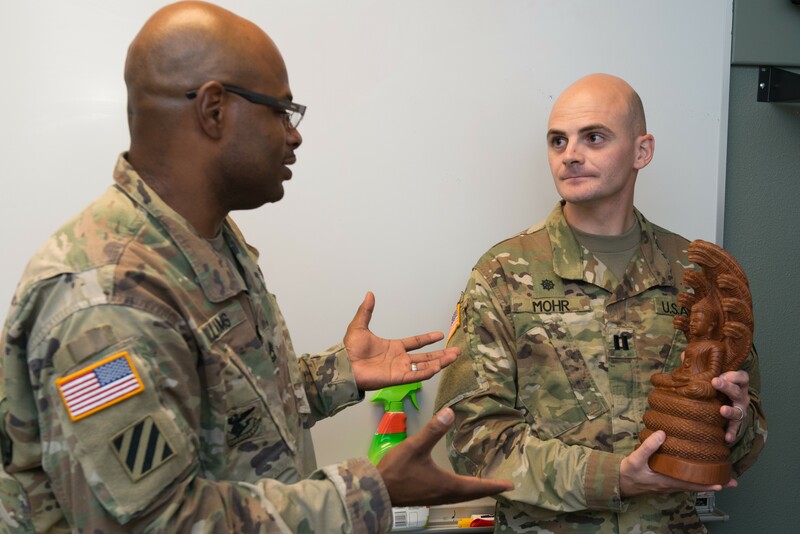 He graduated from the Chaplain's Basic Officer Leadership Course at Fort Jackson, South Carolina, in 2009, and transferred to the California Army National Guard to complete his education. There he served as a chaplain candidate with the 1st Battalion, 185th Armor at San Bernardino, California. Mohr's duties included working under the supervision of a senior chaplain to learn the Army structure and how to operate in a military unit. In 2012, Mohr accessioned as a chaplain after meeting DOD requirements. He was then assigned to the 224th Special Troops Battalion in Pomona, California, serving there until 2013. Mohr returned to the Wisconsin Army National Guard in 2013 and served with the 32nd Brigade Special Troops Battalion in Wausau, Wisconsin, until his entry to active duty in 2014. Mohr is grateful to the Army, saying that his supervisors and colleagues have made the difference by providing time, space, and resources. They have helped him reserve facilities, promote Buddhist services to others, and make available many of the resources he needed. Despite having a degree in religious studies, Mohr said he was unaware of the chaplaincy until he spoke to a recruiter at a job fair. To be directly commissioned as a chaplain candidate, Mohr obtained both his bachelor's degree, and ecclesiastical approval from his endorsing body, while completing an application process, background checks, and a physical evaluation. Once commissioned, Mohr worked toward the DOD's requirements of all chaplains, including a 72 credit-hour master's degree, endorsement, ordination, and two years of ministry experience. Mohr's Catholic mother encouraged him from an early age to explore religion, beliefs, faith, and his spiritual identity. 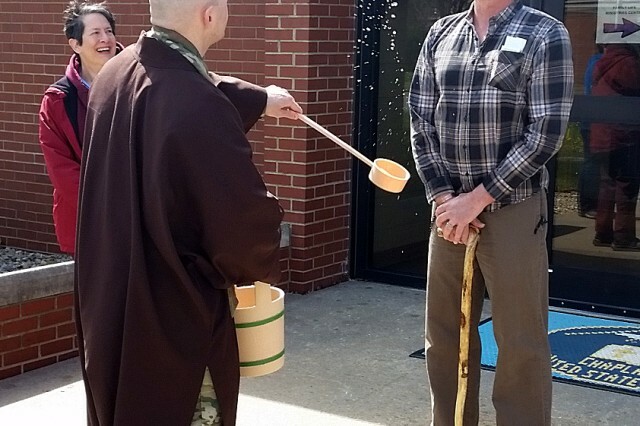 "I came into the Buddhist faith after being invited to visit the head temple of a small religious order of the Shingon school of Buddhism," Mohr said. 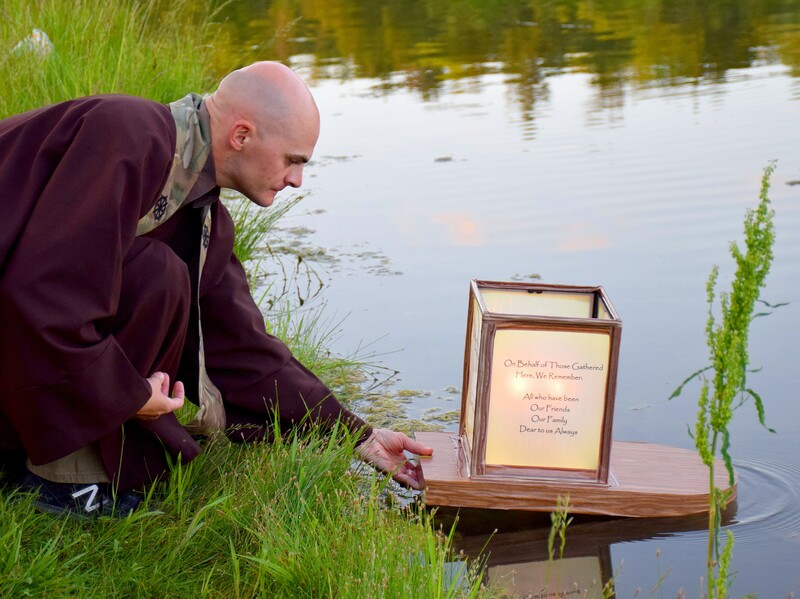 "This school focuses on applying Buddhism to our daily lives and focusing on providing ministry and altruistic service to build harmony within the community where we live. This model fits my particular religious inclinations. It made sense to me when I saw their embrace of the interfaith environment." Mohr formally became Buddhist at the age of 22. He explained that Buddhism is a religion that sprung up from roots in ancient India. It is a religion and teaching that encompasses a variety of traditions, beliefs and spiritual practices based on teachings of Buddha. Mohr was ordained through the International Order of Buddhist Ministers, and endorsed by the Buddhist Churches of America. He practices in the Shinnyo-en tradition, a minor order of the Daigo Temple Lineage in the Shingon school of Esoteric Buddhism. While grounded in Buddhism, Mohr said he puts "a heavy emphasis on functioning in an interfaith environment, and my education, denomination and endorser encourages this as well." "I feel at home working with a wide array of faiths, faith practices, and communities," he said. In July, Mohr spent 12 days visiting Cambodia. He estimates that they visited about 10 Buddhist temples throughout the country. On his return, Mohr brought back two statues of Buddha. One will be used in Buddhist worship services at Fort Riley and the other at his new post at Fort Bliss. "Chaplains are amazing people serving Soldiers, dependents, DoD civilians and retirees, but every once in a while you meet a chaplain who personifies, not only Army values such as respect, honor, integrity and selfless service, but also the values and characteristics of their religious faith," Roxanne Martinez, director of religious education, Fort Riley, Kansas, said. 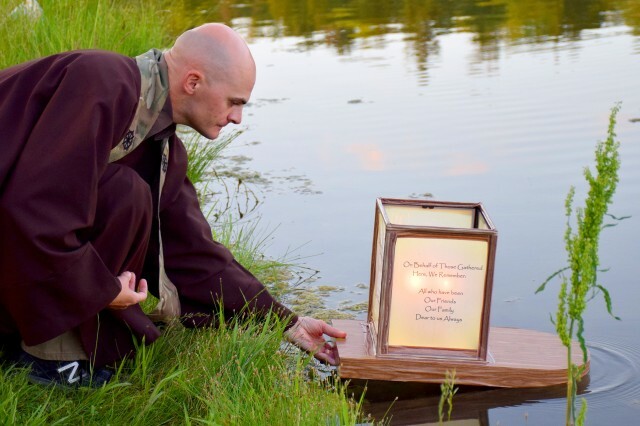 "As a Buddhist chaplain, he embodies the qualities of Buddhism: loving kindness, compassion, joy and equanimity, as well as generosity, love and wisdom. "His talks and teachings on Buddhism were talks that people of all faiths could reflect on in their day to day lives." Martinez said that as an Army director of religious education, she had the pleasure of supporting Mohr in his services for the Buddhist community. Mohr has a special affinity for "tankers and infantryman" whom he says are some of the most loyal and decent humans he has ever met. "They are willing to go the extra mile and shoulder more than their fair share of the burden to help whenever they are able," Mohr said. "One of Buddhism's core teachings is practice equanimity or mental calmness, composure, and evenness of temper, especially in a difficult situation," Mohr said. "In Buddhism, this means to remain centered in the midst of whatever is happening, but it also means that one is to practice a calm compassion when working with people of all faiths." Mohr hopes to someday serve both as a brigade chaplain and a family life chaplain.